It is not the expected narrative we have come to expect but for the second year running major quakes (mag 6 or greater) are down on the previous year with 2017 recording the lowest total this century and the lowest total since the 1980's. With 110 recorded major quakes and a mag 6.3 thought to have been caused by a nuclear test in North Korea bringing the yearly total to 111 that figure is 50 down on this century's average of 161. 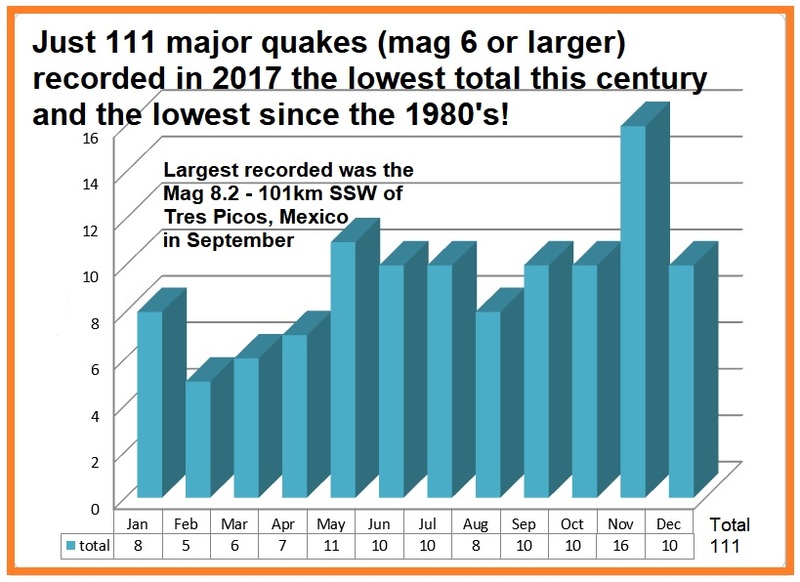 The biggest quake was the historical magnitude 8.2 struck the west coast of Mexico which was the biggest Mexican earthquake in 100 years, however, that quake which struck in September was the only mag 8+ recorded this year. Apart from the mag 8.2 above, only 6 more quakes in the whole year managed mag 7+ with a 7.9 which struck Papua New Guinea in January being the largest. 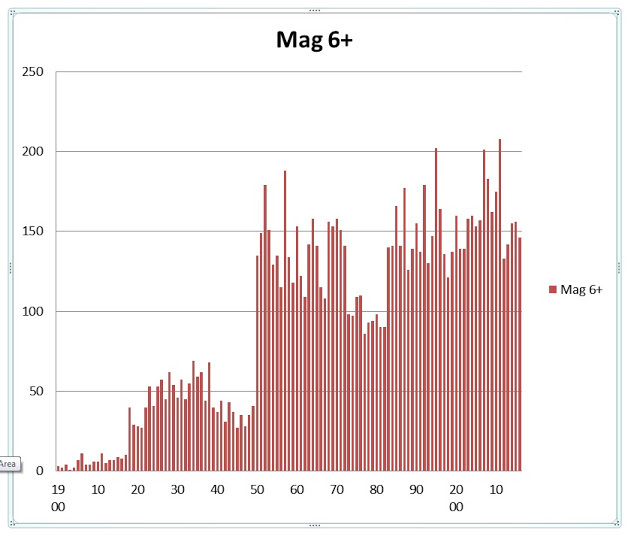 Another massive mag 7.1 struck Mexico three weeks after the mag 8.2 struck in September. 2017 saw Yellowstone becoming a concern as an ongoing earthquake swarm at Yellowstone volcano was one of the biggest ever recorded, with over 2,400 tremors since it began in June. As of August 30, 2,357 earthquakes had been recorded. 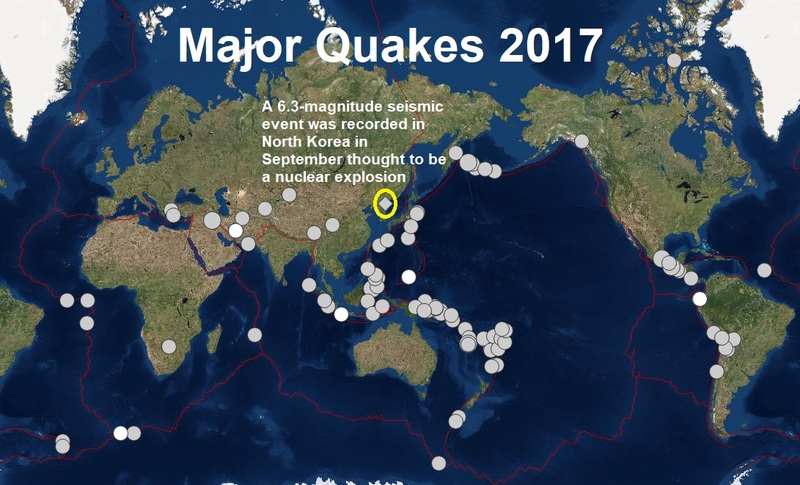 The most powerful in recent was magnitude 3.3; it took place on August 21. The most powerful in the current swarm was a magnitude 4.4, which was recorded on June 15. Septembers mag 5.3 is by far the biggest. 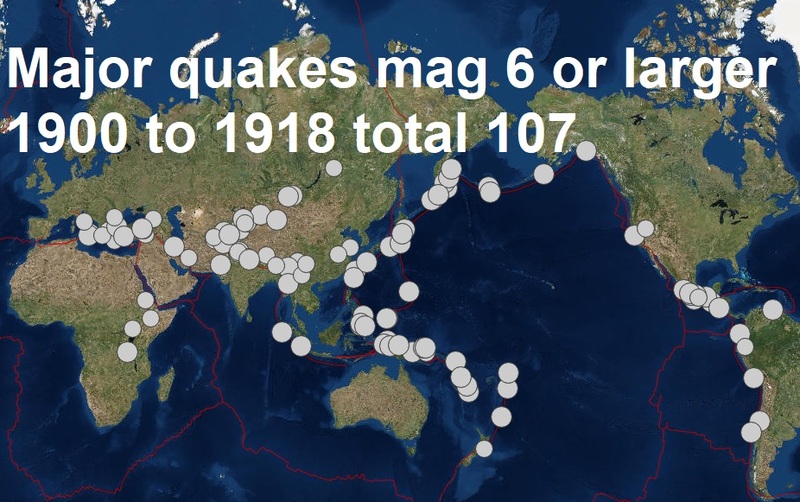 If the major quakes have been down a little over recent years the overall big picture is much different of course, between the years 1900 to 1918 just 107 major quakes were recorded (mag 6 or higher) that 17 year period produced 4 major quakes less than 2017 produced in just one year, see below. 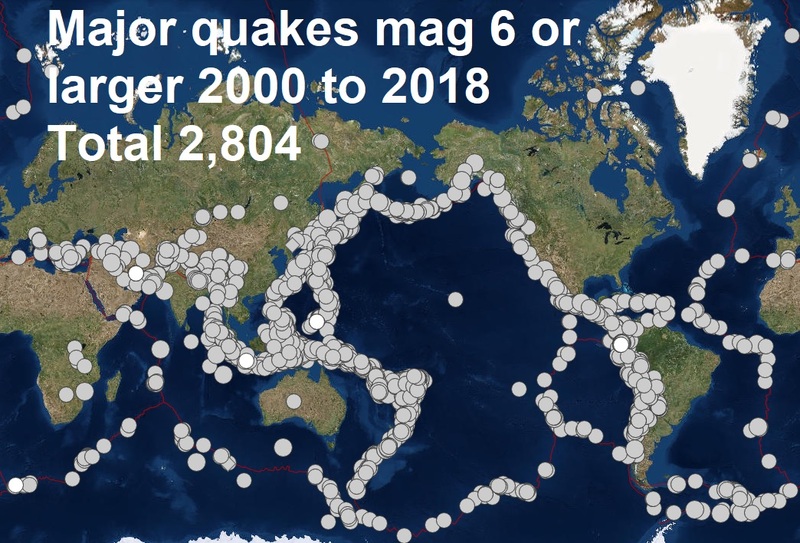 In the same period, 2000 to 2018; 2,804 major quakes were recorded, a staggering 2,697 more than 1900 to 1919. 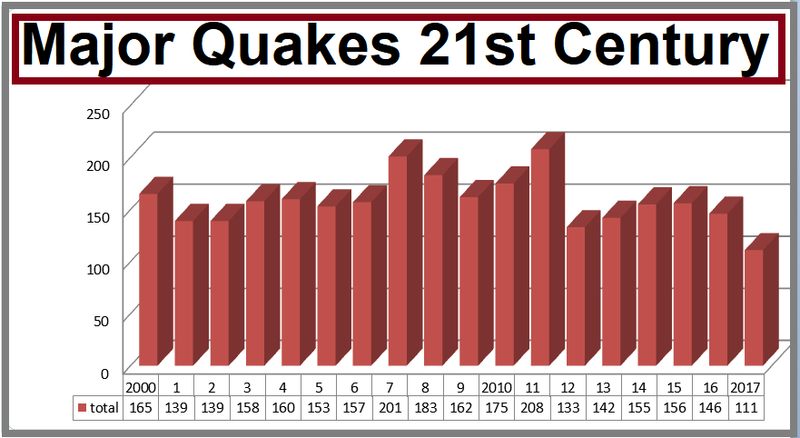 The increase in major quakes since 1900 is staggering, see below.